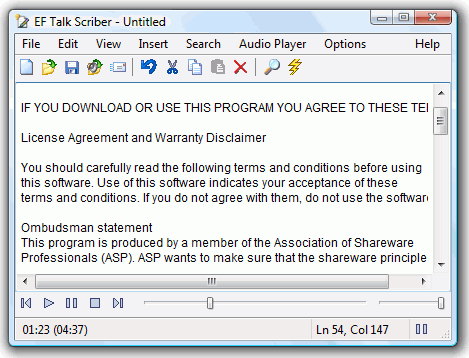 EF Talk Scriber combines a text editor and an audio file player, designed to work like a dictation transcribing machine. It offers the features of a full text editor and an audio media player, plus specific hot links support between text and sound. Your hands don’t need to leave the keyboard — you simply type the spoken words into your computer as the audio file plays. Designed for 32/64 bit Windows.